We commissioned Stanton Williams to help us ‘open up’ the Royal Opera House, with our building physically embodying our core values of creativity, excellence and inclusivity. A new café and improved bars – relaxing spaces in the heart of London to grab a drink, whether or not you’re coming to a show, or enjoy a range of light bites. Free wifi is on offer. A refurbished restaurant – Enjoy a stunning meal in an iconic venue, whether or not you’re coming to a show. 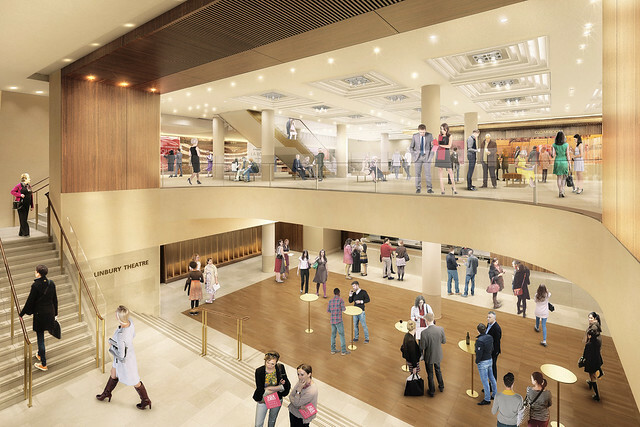 A redesigned Linbury Theatre – The West End’s newest and most intimate theatre. An improved Shop – a destination in its own right with a bespoke product offer. Exciting architectural redevelopment of our front of house spaces – New spaces that unite 19th century grandeur with 21st century elegance, brought to life with displays and collections drawing on the Royal Opera House’s heritage. A new Front of House programme – Taster and full-length live performance in our front of house areas, as well as workshops and interactive digital content. Find out more about our Daytime events.